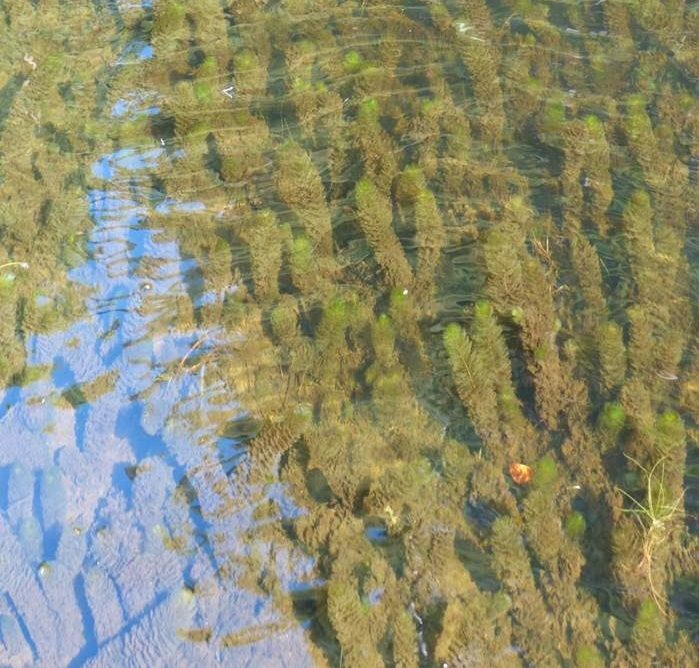 Milfoil is an aquatic invasive plant that is not native to the ecosystem whose establishment causes economic and environmental harm. Milfoil impairs recreational use of waterways including boating and, swimming while degrading the native habitat of fish and other wildlife. 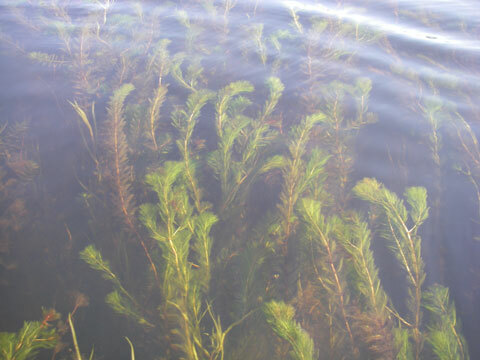 Like all invasive, there are no natural predators to keep the population in check, thus Milfoil grows uncontrollably. Once established, Milfoil is extremely difficult if not impossible to eradicate. 4 feathery leaves whorled around the stem. Each leaf is finely divided, has greater than nine leaflets, and leaf tips are flat. The plant can reach lengths of 15 feet and branches near the surface. Tiny pink flowers may occur on an emergent spike during late summer. 4-6 feathery leaves whorled around the stem, but some leaves can be alternating. Leaves are divided into 7-14 pairs of leaflets. Dense leaf arrangement gives this plant a bottle brush appearance. Stems are thick and reddish-brown. In mid to late summer, blade-like, serrated leaves with small, reddish pink flowers form an erect spike that emerges from the water. 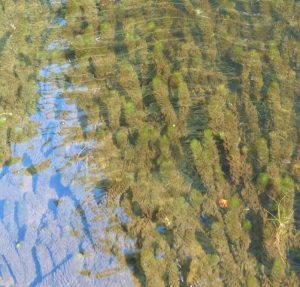 The Upper Saranac Foundation has taken great steps to battle the growth of Milfoil and prevent the introduction of other aquatic invasive species into our watershed. The Milfoil Control Project began in 2004 when it was discovered that Upper Saranac Lake was significantly infested with Eurasian Water Milfoil. A three year, intensive hand harvesting program succeeded in reducing the infestation level to manageable levels at a cost of $1,500,000. Because Milfoil cannot be eradicated, each year since then, dive teams have continued to hand harvest Milfoil to limit re-infestation. Clean, Drain and Dry any watercraft or trailers entering the lake to prevent further invasive introductions. If you see or suspect any invasive species in our watershed please contact our Lake Manager, Guy Middleton. Your continued support and concerns for lake preservation are appreciated.